You may have seen our latest posts on the salon and beauty stores of the future, but in this post we take a look some key trends in the beauty sector overall. There are already a vast amount of beauty products on the market, with new brands popping up almost on a monthly basis. But what trends should these companies be looking at when building their brand or creating their stores, concessions and pop-ups? Carry on reading to find out! Touchscreens. Whilst technology for technology’s sake is never the answer in retail, beauty brands have taken to using touchscreens as an aid. 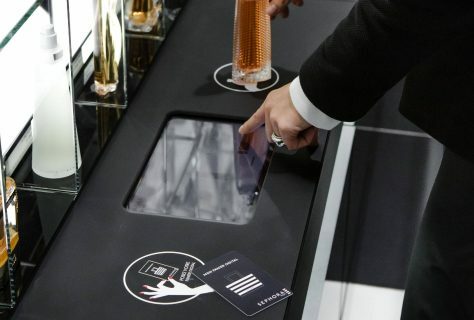 Whether it is for finding a cosmetic product such as the perfect red lipstick (think Marie Claire’s Fabled store) or it doubles as a selfie mirror for SM purposes (think NARS Covent Garden) – using these touchscreens is part of beauty’s entrance into innovative retail. Sephora’s entrance robot handing out cards for virtual product buying is just another realm and we expect to see more of this in retail. Digital Analysers. Touchscreens are ideal for finding a product, but it does not necessarily mean that a customer is going to find the perfect product for them. Brands – we’re looking specifically at Dior for this one – have released digital shade analysers which assess an individuals cosmetic needs, including an examination of the skin condition, before recommending foundations, blushers and lipsticks. This technology is becoming more and more advanced with the additional of virtual reality which we discuss next. Virtual reality is becoming a part of retail stores across the globe and beauty brands are picking up on it. WAH Nails Soho Flagship due to open in Nov 2016 will feature interactive VR to choose a nail design, L’Oreal has two apps for hairstyles and make-up which allows a customer to have a make-over without actually trying anything on and we’ve covered the fantastic use of VR in Sephora on another post. 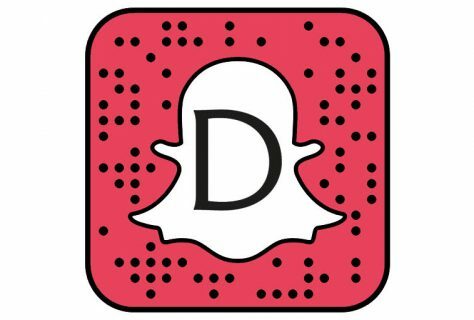 Snapchat has become hugely popular, with many profile pictures featuring a filter or two! 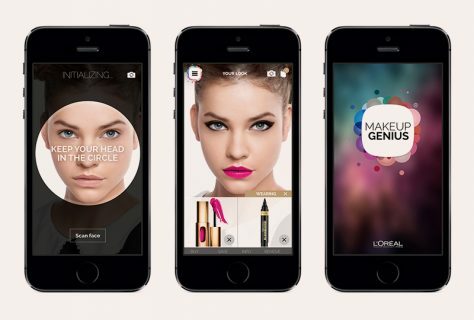 Notable brands or department stores have taken to using this platform to engage; with Adidas recently taking over a filter for the ZNE campaign and Debenhams Beauty Club often using Snapchat Stories for in-store launches or beauty tutorials. #Twitter, although rumoured to be increasing the minimum character limit, is the perfect platform for keeping things real. Product launch, beauty event, celebrity partnership? Explain it in 140 characters, including those all-important hashtags, and see it explode across the world with thousands of retweets – featuring in the trends if you’re lucky. 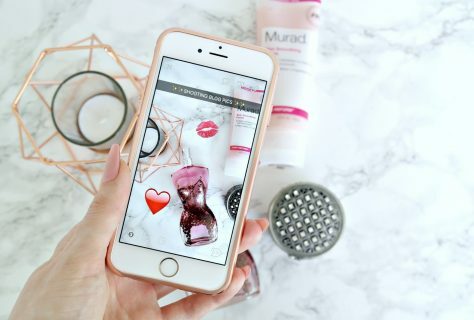 Instagram is a massive hit for beauty brands across the world and is probably the most used by bloggers and consumers for reviews and relevant hashtags. Combining brands, bloggers and consumers in one channel, Insta benefits from telling a story with an image; something we can all get on board with. 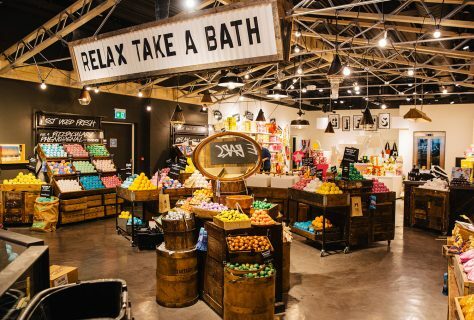 Lush’s Oxford Street store is stunning in terms of its interior design, but it’s the inclusion of customer experience and interaction which is the huge win. Not only is the store vast in size and stunning to enter, but it also features the following: on-site Hair Lab, #selfie mirror, underground spa and a music station. An immersive experience over three floors, it’s worth a visit if you haven’t already. 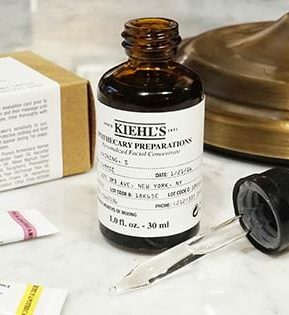 Khiel’s have certainly recognised the concerns that many of us have with regards to our skin and have sought to rectify this. Offered exclusively at their Harrods concession, customers can purchase a concentrate which is designed entirely to suit your skincare needs. 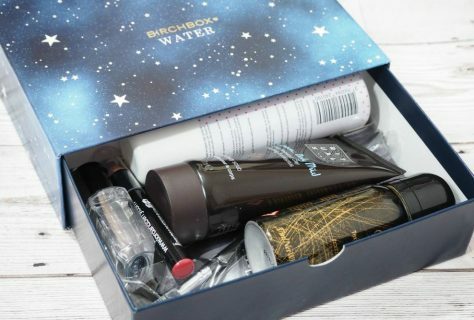 Birchbox. Yes, slightly off-topic with regards to store design as Birchbox isn’t a store but an online service instead. 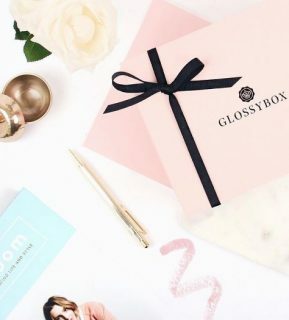 Create an account, detail your hair and skincare needs and then sign up to a beauty box which you receive once a month filled with what the company feel is right for you. 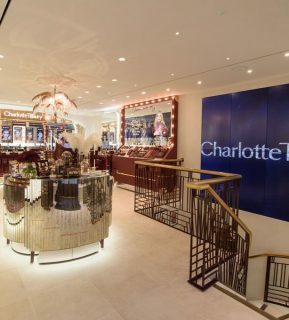 See more about online-beauty trends below..
Charlotte Tilbury’s store in Covent Garden is undeniably beautiful with luxurious rose gold, art deco styling and vintage mirrors. However, it’s the inclusion of a champagne bar and glamorous dressing tables for make-overs which really stands out for customers. Being made to feel fabulous in a beauty store is a win in our eyes. Christian Louboutin has been the talk of the town for a little while now, following the launch of their concession within Selfridges’ beauty hall. From the moment you step inside, the ultimate feel of walking into a luxurious spa fit for a celebrity hits you. Whilst it may not be typically girly, it is premium in its use of gold and black and lighting is use thoughtfully in each section. 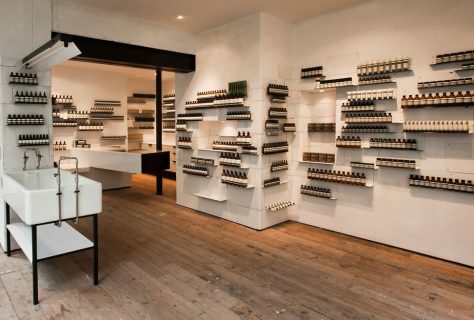 Aesop stores across the globe are creatively designed to both promote the brand and its personality, whilst also playing homage to the location in which they are built. For instance, the Soho store reflects the evolution of its local environment with a minimal but sophisticated aesthetic, situated on the ground floor of a historic building. 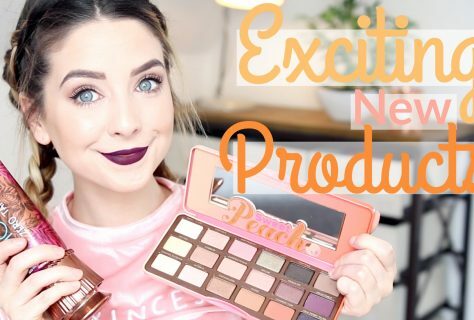 With the success of e-commerce sites for brands within numerous sectors, it’s unsurprising to see beauty brands jump on the online train. However, whilst many big brands have an e-com website to coincide with their stores and concessions, there are online subscription-only beauty brands cropping up. Some of the biggest names in this area are Birchbox, Glossybox, Boxycharm and Ipsy. All offer a monthly box of beauty products from various beauty retailers, with the products inside the box suited to your needs. For instance, customers with sensitive skin and afro hair would receive an entirely different box that those with combination skin and straight hair. The consumer does not choose products for the box (although they are available to buy separately on the website if they are liked) and instead relies on the company to send them products to suit their skin and haircare requirements. Often being referred to as the future of beauty retailing, these beauty boxes will increase in numbers in the coming years. However, for physical retailers, the threat is minimal as consumers still enjoy trying products in-store and returning for their favourite brand and / or products. It’s unusual to go a day or two without seeing a post on a retail design blog or social media channel, referring to a new store opening! Taking our ‘watch this space’ spot for the beauty sector is WAH NAILS which opens its Soho flagship store next month – take a look at our previous posts for more information. Virtual reality + social + digital all form this concept store for WAH, created and owned by Sharmadean Reid. The photographs so far look amazing and we’re sure that it will look even better when we see it first-hand. Keep an eye on social media for details – we will be!